Step right up, step right up! I'm so glad you stopped by! I do have to thank the wonderful hostess for this lovely party! Thank you Lisa!!!!! Come on in, there's games and a prize and cotton candy!!!! I do have to throw my dress on really quick.... And add some jewels, go ahead try some on! Oh you look "maw~velous"!!!!! You can keep those! 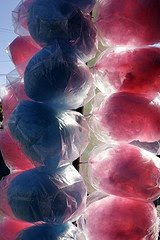 Please help yourself to some treats, cotton candy is the best! You must grab an umbrella... Oh yay, more people are arriving! Please meet the carnival pixie! How do you do?! And the queen of the party! And this gal is sporting a lovely vintage party hat, that could become YOURS! All you have to do is leave a comment and on Monday I will pick the lucky winner!!!!!!! So please don't forget to leave a comment! I'm so happy you've stopped by, please hang around and mingle awhile!!!!! Your post is so fun! I love it, great job Lola! Hi Lola, Great post and I see you also have the clown bank. What fun. PS: I have not forgotten about your blog award, and will post in a few days...thanks again! I"ve been having fun at Lisa's too! everybody is in such a festive mood today! Great post! And your blog is so beautiful! Great layout! How cheery and festive! Don't forget to comment on post no.7 for the giveaways! Great Job Lola..I love the music you have playing and I grabbed some Cotton Candy...giggling...What a lovely time I had at your carnival... Have fun tonight! See you at the Carnival! What fun I am having and I've met so many people all having a very good time at the carnival. Your post is fun and full of lovelies! Thanks! What a lovely vintage party hat...and fun post! It was fun hanging out with you at the carnival...would you like to join me on the teacups before it gets too late? Holly Cow...I finally made it Lola, I've been carnival hoping...whew..what a lovely post..I love the dress! Your carnival is wonderful, I love each carnival image...your blog is beautiful. I love your carnival post, what fun, you are so creative! Thanks for stopping by my blog last night, what a fun soiree it was! Oh what a fun post! HOW FUN!!! !